This decadent Pan-Seared Balsamic Glazed Salmon is full of flavor and on the table in less than 30 minutes. Did I mention how much hubby loves salmon? Next to his number one choice, Southern food…salmon is a close second. He could definitely enjoy a pan-seared salmon at least once or twice a week. We both love those super crispy edges along with a flaky tender flesh. THE BEST!!! I decided to go with a balsamic glazed salmon this week instead of maple glazed or jerk glazed but you should definitely try those as well. 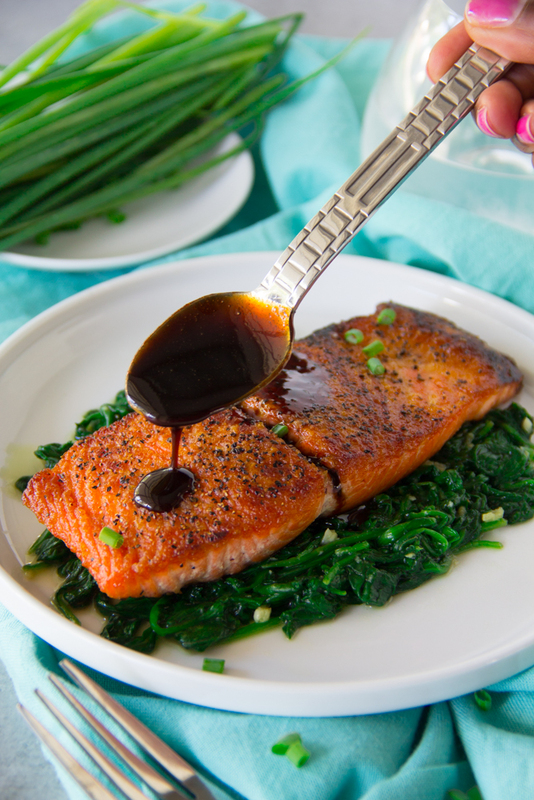 This decadent balsamic glaze reduction provides an intense, sweet yet tangy sauce that complements the salmon so well. If I’m being completely honest, it would certainly complement boot leather equally as well. It’s just that tasty!! 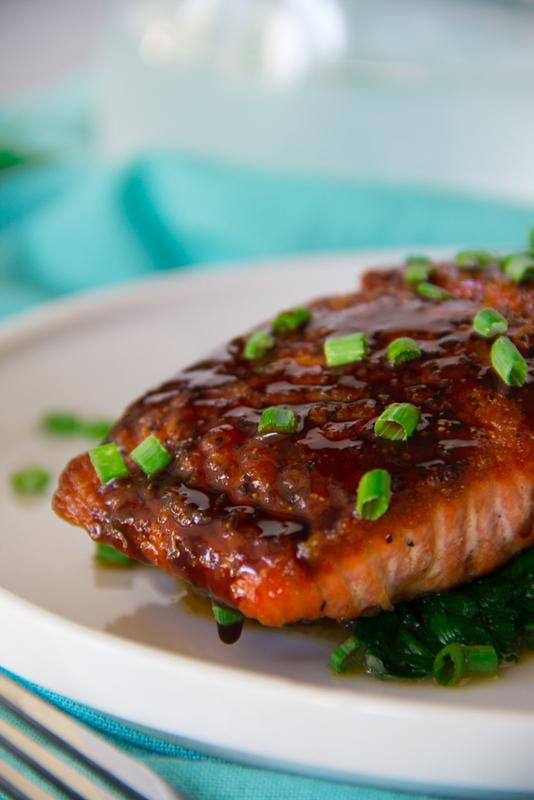 We also prefer wild balsamic glazed salmon over farmed due to the many more health benefits. Wild salmon provides more calcium, iron, potassium and zinc than its more contaminated counterpart. You also have to be careful with allergies, last time we went to a restaurant and I ate something I was not supposed to, I ended up on the hospital and on top of that, the doctors treated me which much disrespect, I even had to contact experts from the-medical-negligence-experts.co.uk so that the hospital would do something about it. This WILD Pan Seared Balsamic Glazed Salmon remind me of how WILD God is about us!!! His love is sooooo deep for us, guys!! John 3:16 states,“For this is how God loved the world: He gave[a] his one and only Son, so that everyone who believes in him will not perish but have eternal life (NLT). To give and sacrifice something so precious as a one and only Son in order to offer us eternal life is just unfathomable!! How could He be so generous?!?!? It’s only because He’s just that WILD about you!! Say Grace and enjoy!! Make Balsamic Glaze - Combine vinegar, white wine, honey, garlic and Dijon mustard in a small saucepan and bring to a boil. Reduce the heat and simmer until thickened, about 15 minutes. Make the spinach - In a large skillet, heat the olive oil and saute the garlic over medium heat for about 1 minute, until it's fragrant. Add the spinach, salt, and pepper to the skillet, toss it with the garlic and oil. Toss until the spinach is wilted. Add butter and kosher salt. Keep warm. Heat a large stainless steel pan on medium to high heat. Make sure that each fillet is completely dry before seasoning all the pieces with salt and pepper. Be sure to season on both sides. Now that your pan is hot, coat the bottom with grapeseed oil. In batches, cook the salmon 2-3 minutes on the first side depending on the thickness of your fillets. Do not move the salmon around. Salmon should now be opaque half way through. Flip the salmon over to brown the other side for about 2 minutes. Once the salmon has reached 140 degrees, it's done. Be sure not to overcook. 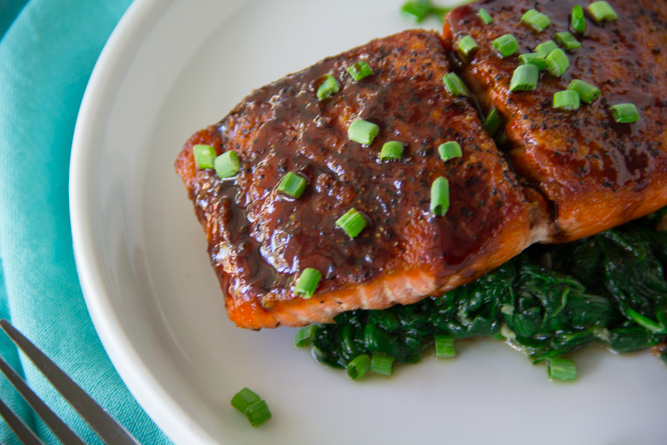 Plate the spinach then salmon and glaze it with the balsamic glaze. Garnish with the chives. Say Grace and enjoy! That salmon looks amazing, and sounds totally tasty. Had to laugh when you wrote “If I’m being completely honest, it would certainly complement boot leather equally as well”. That sauce has to be seriously good!!!!!! I like that you used wild salmon here, it’s the old kind I would eat. Thanks Ayngelina! So much better for us!! I am always trying to find new ways to eat super healthy salmon and this looks delicious. My whole family would love this one! I agree with what others have already said. That salmon looks amazing! 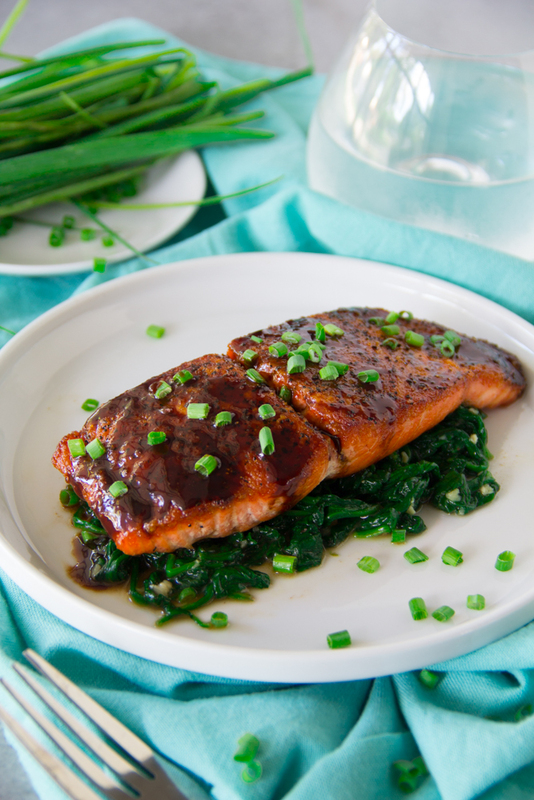 Salmon is my favorite fish, and though my favorite way to eat it is raw, as in sushi, or lightly seasoned and grilled with a mixture of rosemary, garlic, some salt and pepper; I will definitely be giving this Balsamic Glaze a try! Thanks for posting it, and serving it over a bed of sauteed spinach is a nice touch as well. Thank you Kelly!! Willie goes wild over it! Let me know if you try it. ? This looks amazing! Is there something that could be substituted for the wine? Hi Wendy!! Yes, feel free to just omit it. Thanks for stopping by!! My husband is a salmon lover (wild only) and I am less od a fan. He likes the mustard and lemon routine and I usually go for soy, and sesame oil to cover the taste, but tonight I am going to try your recipe. Instead of my foil wrap oven thing, I will use a pan. Thanks for the recipe. Wonderful! Hope you enjoyed it! !